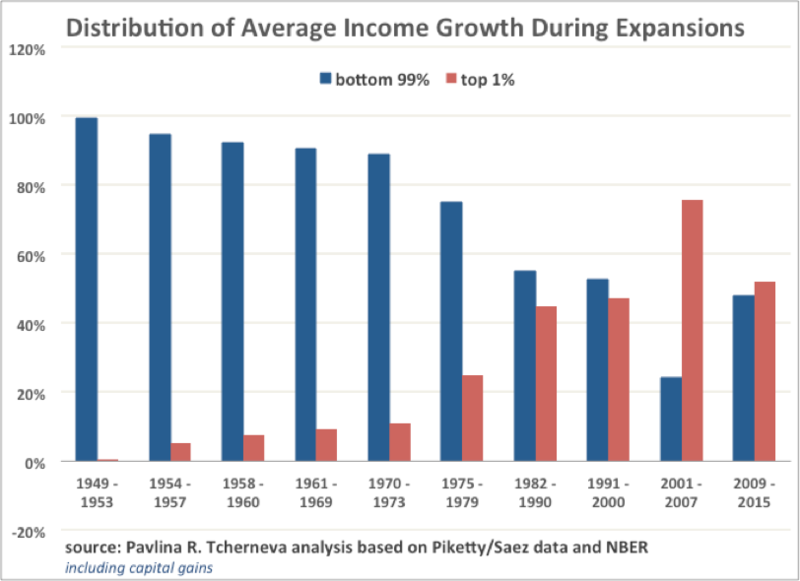 Inequality Update: Who Gains When Income Grows? Growth in the US increasingly brings income inequality. A striking deterioration in this trend has occurred since the 80s, when economic recoveries delivered the vast majority of income growth to the wealthiest US households. This note updates my original inequality chart (reproduced below) with the latest data. For earlier discussions, see e.g., here, here, and here. 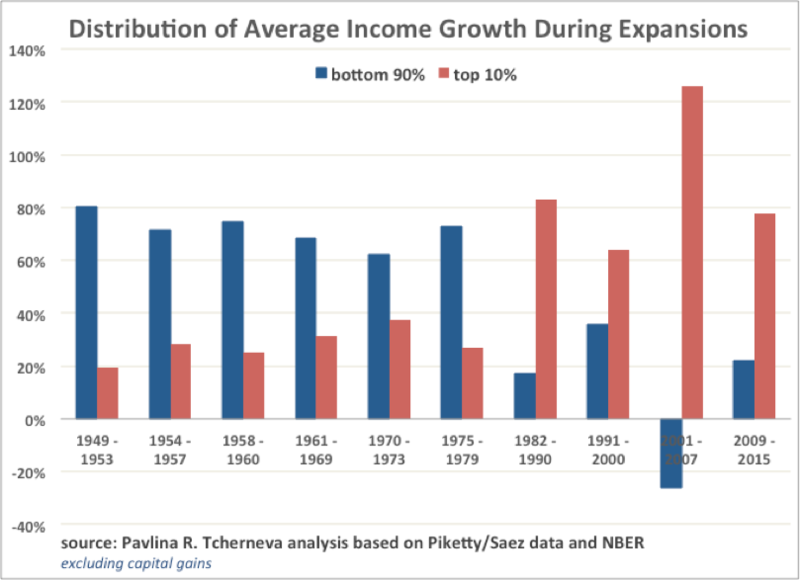 The chart illustrates that with every postwar expansion, as the economy grew, the bottom 90% of households received a smaller and smaller share of that growth. Even though their share was falling, the majority of families still captured the majority of the income growth until the 70s. Starting in the 80s, the trend reverses sharply: as the economy recovers from recessions, the lion’s share of income growth goes to the wealthiest 10% of families. Notably, the entire 2001-2007 recovery produced almost no income growth for the bottom 90% of households and, in the first years of recovery since the 2008 Great Financial Crisis, their incomes kept falling during the expansion, delivering all benefits from growth to the wealthiest 10%. 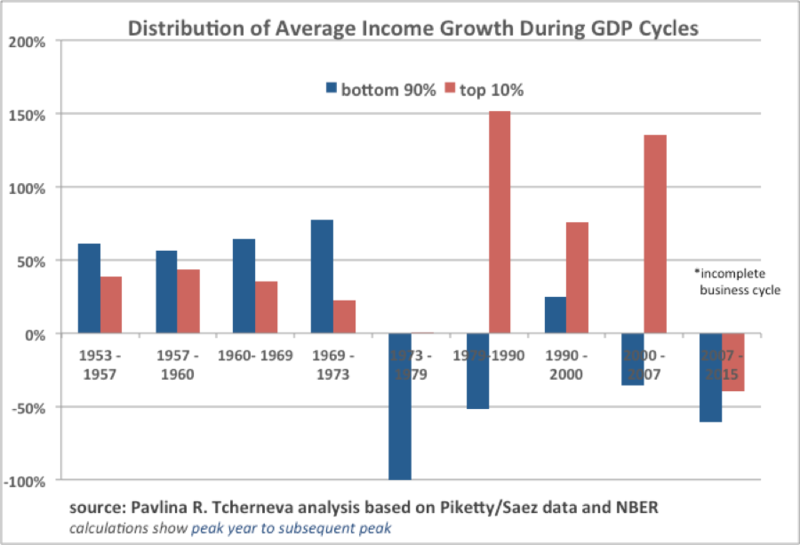 A similar trend is observed when one considers the bottom 99% and top 1% percent of households (for details, as well as complete business cycle data, see here). 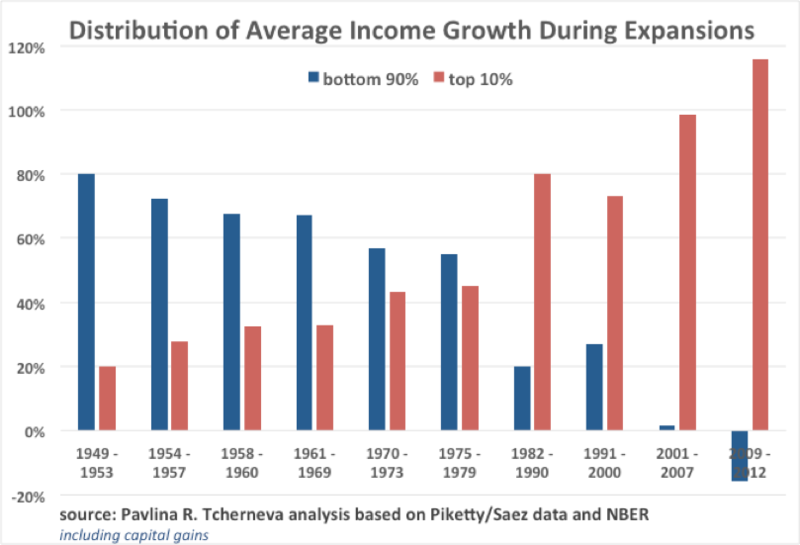 The following figures update this analysis with the latest data (up to 2015) by looking at the distribution of average income growth (with and without capital gains) between the bottom 90% and top 10% of households, and between the bottom 99% and top 1% of households. We find that little has changed when considering the distribution of average income growth between the bottom 90% and top 10% of families, with or without capital gains (figures 2 and 3, respectively). One difference is that average real income for the bottom 90% of households is no longer shrinking. In 2014 and 2015 it finally began to recover. Nevertheless, these families still capture a historically small proportion of that growth—only between 18%-22%. The growing economy continues to deliver most benefits to the wealthiest families. Since the top 10% of households is a rather heterogeneous group (see table 1), we consider the distribution of average income growth between the bottom 99% and top 1% (Figures 4 and 5). 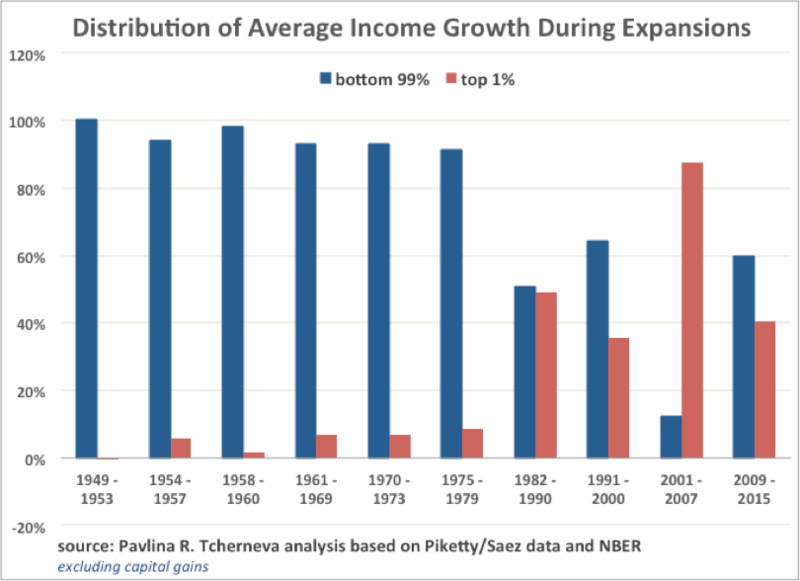 Figures 4 and 5 show that incomes of the bottom 99% (with or without capital gains) have recovered more robustly than those of the bottom 90% (Figures 2 and 3), meaning that the improvements are primarily concentrated in the next richest 9% of families. Their share of income growth is either 30% or 38%, depending on whether or not one includes capital gains, respectively. Finally, Figure 6 shows how income growth has been distributed over the different business cycles (peak to peak, i.e., including both contractions and expansions). The data for the latest cycle is incomplete, as we are still in it. The graph indicates that in the current cycle, incomes for all groups are still lower than their previous peak in 2007, however the loss is disproportionately borne by the bottom 90% of households. 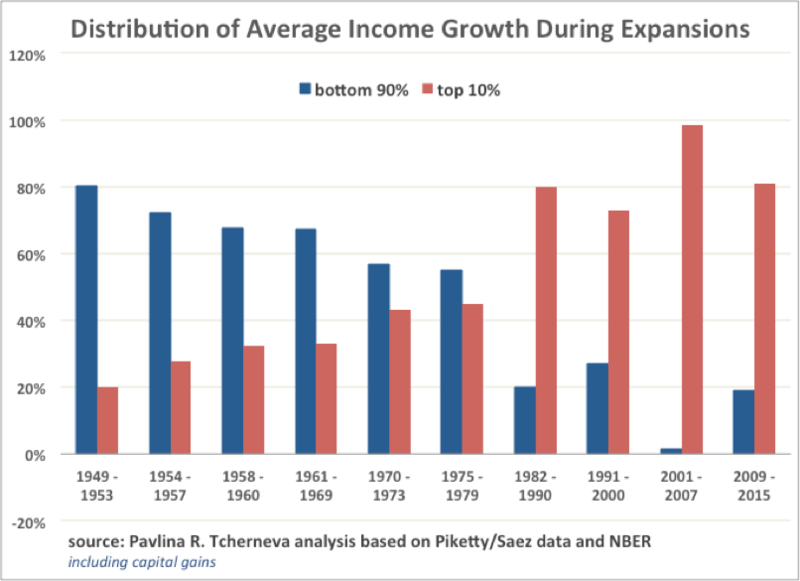 In sum, the growth pattern that emerged in the 80s and delivered increasing income inequality is alive and well. The rising tide no longer lifts most boats. Instead the majority of gains go to a very small segment of the population. As I have discussed elsewhere, this growth pattern is neither accidental nor unavoidable. It is largely a bi-product of policy design, specifically the shift in macroeconomic methods used to stabilize an unstable economy and stimulate economic growth. The analysis is based on Piketty and Saez data (2003, updated 2016), which report real average market income before taxes and transfers. Market income includes wages and salaries, entrepreneurial income, dividends, interest income and capital gains. This entry was posted in Pavlina R. Tcherneva and tagged inequality. Bookmark the permalink. Thank you for your fascinating work (and for the links to your previous posts and papers). I, however, have one question. That might be a typo or I misunderstood something, but looking at figures 4 and 5, I’d say the income shares of the bottom 99% are respectively slightly less than 50% (figure 4) and about 60% (figure 5). So, I don’t understand the 30% and 38%. Thank you for your comment. The share of growth for the bottom 90% of households is 18% with capital gains and 22% without. The share of the bottom 99% of households is 48% with capital gains and 60% without. The difference that goes to p90-99 is 30% and 38%, respectively. Hope this helps. When useful produce is made or services given, the distribution of the costs for its availability are surely split according to the amount of land, labor and capital required. This is according to Adam Smith 1767 “Wealth of Nations”. The remuneration for labor logically should correspond to the value that this activity adds to the cost and price of the product. When this does not occur, as is clearly the situation explained in the above article, there must be some corrupting influence of a monopolistic kind that causes the naturally competitive forces to be stopped from being effective. A wise and just government should work endlessly to reduce this degree of corruption to a minimum, yet we see that in many countries the opposite is taking place and unreasonable high salaries and taxes are being paid to/by a few privileged people in high management positions. It is high time these practices were stopped and that the valuable work being performed by these people in control be remunerated appropriately but not excessively.